No pictures of monkeys?!! Jim, you missed the most important part of the zoo. Now go right back there and get some good photos of the monkeys. I'll wait. The zoo really is one of our favorite places in the city. Beware that during the winter (i.e. slow season) they close at 4:00. And they are closed on Monday's and Tuesday's. I think their hours are more expanded in the spring when it warms up. If your family goes to the zoo several times a year, it's worth it to look into a zoo membership. For $75 you can get your entire family in as many times as you want, parking is free, and you can get into special events for free as well. Normal admission for a family of four is $42 (two adults and two kids plus parking), so if you go twice you've paid for your yearly membership. For $95 you can get the Family Plus Two membership that lets you bring friends as well (great if the grandparents visit a lot or you want to do a playdate at the zoo). As a career-mom, I find the zoo to be fantastic. Its wide-open paths, sometimes-of-interest-to the-toddler animals, and the train can eat up an entire morning. Often the space between "Wake-up!" and "Daddy's home!" is deep and wide. 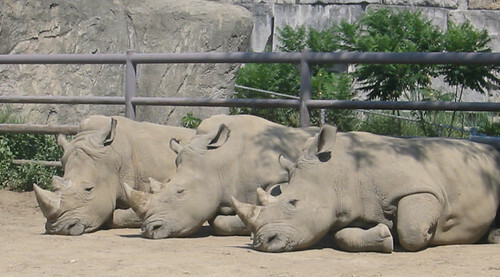 A visit spent jumping on the rhino's suspention bridge just might get you to naptime sooner. I recommend the "Individual plus one" (for you and your kid) membership in case your partner finds the zoo "boring." Sounds like a baby elephant was born yesterday. You were "bored" with the animals at the zoo because the animals are bored. Can you imagine being locked up your entire life - albeit for "your own good" and to "preserve your species." Pretty damn dull, I must say. Nowhere to go, same ol' same ol' every day. Please, try to think a little less superficially! Put some some big brawny human brain into it, man! Don't you think it odd that so many are in opposition to your views that you had to take steps to "curb malicious comments"? What could possibly be the reason for this? Do your research! Check out ZooCheck, or maybe the library if you're not into the whole brevity thing. Chris, I used to feel the same way about animals in the zoo until I read the Life of Pi (http://www.amazon.com/gp/product/0156027321). There is a chapter in the book that explores this topic. After reading it, I no longer feel sorry for animals in the zoo. No matter how boring they may act when you are watching, they are fine. They are doing what animals do. Chris, the malicious comments we're curbing are unrelated spam comments, not differences of opinion. "The African elephant Ivory gave birth to 226-pound girl during a ten-minute delivery Thursday night. "Ivory was resting," said David Hagan of the Indianapolis Zoo. "She'd laid down for the night. And all of a sudden got up. They took a quick peek and they could see a bulge in the back and ten minutes later it was on the ground," he said. Ivory and her yet-to-be-named daughter are doing well. News of the birth traveled fast despite being off-limits to visitors until later this month." Umm I really liked your article-one thing though-those are walruses not manatees. The only reason I know this is because for some strange reason my two year old has great walrus fear and shrieks whenever we go near them at the zoo. Thanks for the correction, Laura! The walruses come up to the glass because the youngest, Nereus, loves to interact with the children. And since I work at the Zoo on a daily basis and am an avid animal lover, I can honestly say that the animals are doing exactly what they would do in the wild. My tip: go when it's cold, rainy, or extremely early. They do more then. You should tell what to bring on a field trip on a rainy day!!!!!!!!!!!!!!!!!!!!!!!!!!!!!!!!!!!!!!!!!!!!!!!!!!!!!!!!!!!!!!!!!!!!!!!!!!!!!!!!!!!!!!!!!!!!!!!!!!!!!!!!!!!!!!!!!!!!!!!!!!!!!!!!!!!!!!!!!!!!!!!!!!!!!!!!!!!!!!!!!!!!!!!!!!!!!!!!!!!!!!!!!!!!!!!!!!!!!!!!!!!!!!!!!!!!!!!!!!!!!!!!!!!!!!!!!!!!!!!!!!!!!!!!!!!!!!!!!!!!!!!!!!!!!!!!!!!!!!!!!!!!!!!!!!!!!!!!!!!!!!!!!!!!!!!!!!!!!!!!!!!!!!!!!!!!!!!!! i do enjoy the way you have framed this particular problem. i do enjoy the manner in which you have framed this situation. unlikely that they will able to resume normal duties for some time. your surgeon may not be able to complete the dramatic transformation you're hoping for.